100 feet of private beach in a quiet and exclusive neighborhood area. Wake up to spectacular sunrises. Look out towards Power Island(Once owned by Henry Ford). At night, look out over the water to see the lights of Traverse City in the distance. This fully furnished newly remodeled cottage with large windows for your unobstucted panoramic views. Only 50 feet from the water (10 steps down). Every room has a view of the water. The kitchen is open to the living room which allows exceptional views as well. The cottage is immaculate. Our renter customer feedback surveys from 2017 have rated 'cleanliness' as 'outstanding' by 100% of our renters, 'location' as outstanding by 90% of our renters. In addition, 100% of our renters indicated 'our web-site description was accurate' and 100% said that 'they would consider coming back and renting from us again'. Each bedroom has a queen bed and the living room has a double size futon and an extra couch. WiFI is available. 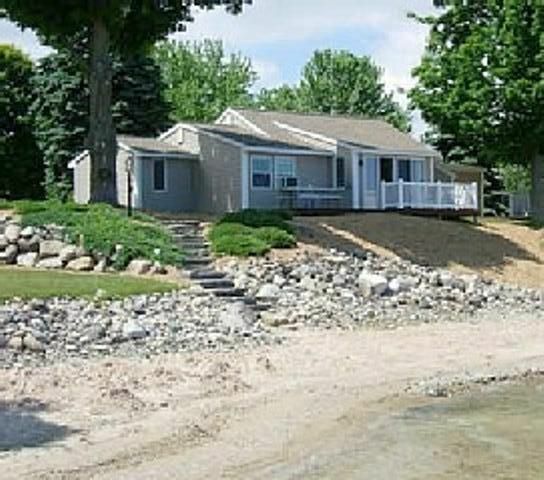 The cottage is 6 miles south of Suttons Bay and 8 miles north of Traverse City. This cottage is located on a small side street away from any main road. A convenience store is less than a 5 minute walk. Perfectly located for the many activities of Traverse City and Leelanau County. Enjoy the beach, swim, boat, water ski, fish. A public boat launch is less than 1 mile away. Enjoy wine tasting at the many wineries only minutes away. Several golf courses are nearby, one is located less than 10 minutes away. If you prefer live entertainment and gaming, the Leelanau Sands is a 12 minute drive away. The paved Leelanau trail (15 miles long) is great for hiking and biking is 1 1/2 miles away. The Vasa trail is a 25 minute ride away. Great Dining and shopping is also just minutes away. Enjoy the many fall and winter activities. Fall activities include color tours, golf, or wine tasting at the numerous nearby wineries. Winter activities such as downhill and cross country skiing, snowboarding, sledding and tubing, snowmobiling are all nearby. Full Kitchen, Dining Room Table and Chairs and a sit up Breakfast Bar with 3 chairs. Brand New Big Screen TV. A Binder loaded with things to do in the area which includes telephone numbers, emails, and maps. Great views, very clean house. Great view of the bay. Close to TC and SB, great location. Owner is very detailed and made the stay easy with clear instructions. We had a wonderful time staying here. Clean, right on the water and just a short drive away from everything. We enjoyed sitting on the deck each morning and hearing the sound of the waves off of the Bay. We will definitely be back! The cottage is perfect for a weekend getaway or an entire week stay. Duane and his wife were gracious when we arrived and gave us tips on some local spots. We definitely will return when visiting the Suttons Bay area. Stunning views and very quiet peaceful area. Very clean and well kept. This place had everything we needed, can’t wait to come back! We are very pleased that you had a great stay. Congratulations on your future event. We couldn't have been more pleased with our stay at this cottage! It was our first trip to the TC/Leelanau area, and the cottage met all of our needs. We have young children who enjoyed "their" very own private beach each day, while the adults could enjoy the peace and quiet of West Bay. The location is a convenient starting point to all the fun and activities in this area. Perfectly tucked half way between Traverse City and Suttons Bay. When we vacation in the area again, we will want to stay here! A guestbook is located at the guest house which provides local highlights, things to do (Sleeping Bear Dunes, Beaches, Tart Trail, Leelanau trail, parasailing, canoeing, bicycle rentals, golf courses, Casinos, wineries to visit, restaurants, etc.) with contacts, locations, websites and phone numbers.